Returning for the 5th Straight Year for 2 Great Nights! The World-Famous Glenn Miller Orchestra is the most successful Big Bands of all time playing nearly 300 SHOWS EACH and EVERY YEAR from the 1930's to today! They've played in all 50 states as well as in most countries throughout the world. The 18 member GMO plays the original Miller arrangements from their road library of over 300 charts. They perform a matchless string of hits including "Chattanooga Choo-Choo", "Pennsylvania 6-5000", "Moonlight Serenade", "In The Mood", "Little Brown Jug", " A String of Pearls", "Tuxedo Junction", "Don't Sit Under The Apple Tree" and much more during their 2 hour show! The Legendary Glenn Miller Orchestra's "current" resurgence began in 1956 following popular demand arising from the release of the blockbuster hit film "The Glenn Miller Story" starring Jimmy Stewart and June Allison. The current touring ensemble consists of the classic Big Band complement, a music director, a male and female vocalist, 4 trumpets, 4 trombones, 5 saxes, piano, bass and drums and they play to more than a half a million people a year! 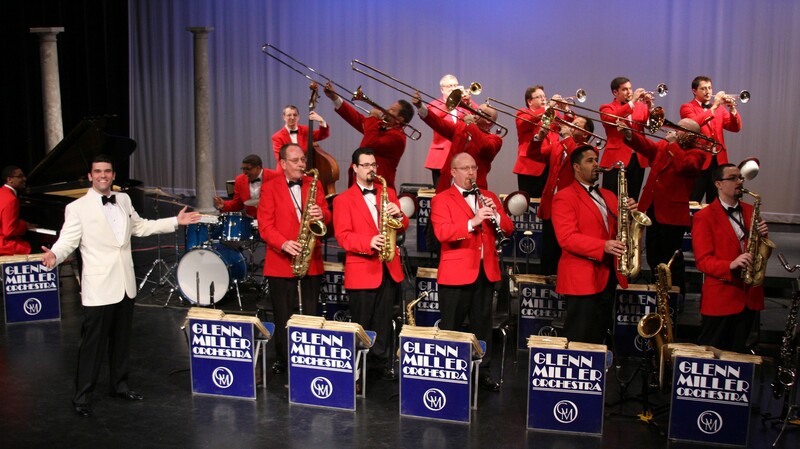 Just as it was in Glenn's day, The World-Famous Glenn Miller Orchestra is still the most sought after Big Band in the world and they're back once again for a their annual 2 night summertime engagement.